Ngsabala ichange ngizwe nge Slay Queen sithi "Driver after robot put me down"
Me: konje nithe niy'100 ku R13:50? After 2 minutes ngizwe nge "VIMBA"
So a husband cheats by mistake and in return the wife cheats too but ends up pregnant, So who tore the family apart? 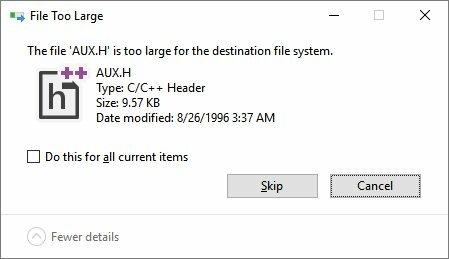 It is 2018 and this error message is a mistake from 1974. This limitation, which is still found in the very latest Windows 10, dates back to BEFORE STAR WARS. This bug is as old as Watergate. When this was developed, nothing had UPC codes yet because they'd just been invented. Back when this mistake was made, There was only one Phone Company, because they hadn't been broken up yet. Ted Bundy was still on the loose. Babe Ruth's home run record was about to fall. When this bug was developed, Wheel of Fortune hadn't yet aired. No one had seen Rocky Horror. Steven Spielberg was still a little-known directory of TV films and one box-office disappointment. SNL hadn't aired yet. The Edmund Fitzgerald was still hauling iron ore. WHEN THIS STUPID MISFEATURE WAS INVENTED, THE GODFATHER PART II HAD JUST OPENED IN THEATERS. So, why does this happen? So Unix (which was only 5 years old at this point) had the good idea of "everything is a file" which mean you could do things like write to sockets, pipes, the console, etc with the same commands and instructions. So, about 5 years ago, we got on facebook. Why? Well, facebook has a big audience and they like to consume on facebook. So, we started posting comics there, even though we got paid nothing and facebook made money off the free content. Why? Because back then, once in a while, you would say "also hey, I sell books" or "hey, I'm going to be signing at this event" and your facebook followers would actually see it. Effectively, the implicit old arrangement was "facebook lets me reach readers efficiently, and I supply facebook with free content they run ads on." Over time, like a bad business partner, facebook basically made it impossible to reach your audience without *paying them*. Thus, you supply them free content on which they run ads, and you get nothing in exchange. Joe Rogan's podcast is now is listened to 1.5+ billion times per year at around $50-100M/year revenue. Independent and 100% owned by Joe, no networks, no middle men and a 100M+ people audience.